You want to make your Facebook totally private to anyone but your actual friends? You can’t, though you can come close. And it will only take you 50 clicks inside Facebook’s Wonderland-like labyrinth of privacy controls. Have fun. This week brought news of two separate bugs that let Websites secretly install their apps on your Facebook profile and let your friends eavesdrop on your private chats. Facebook swatted both bugs relatively promptly, but not before they made their way into the press. I can understand how Facebook missed the chat security hole — you have to follow a fairly arcane series of steps to reproduce it. But calling the secret app problem a “bug” is a bit hard to swallow. Want more? Matt Yglesias shares Harvard memories of Zuckerberg’s questionable dedication to privacy ethics here. And Matt McKeon’s clever timeline of Facebook’s eroding privacy defaults is here. For my part, I’ve redrawn a part of McKeon’s graphic in a different format below. 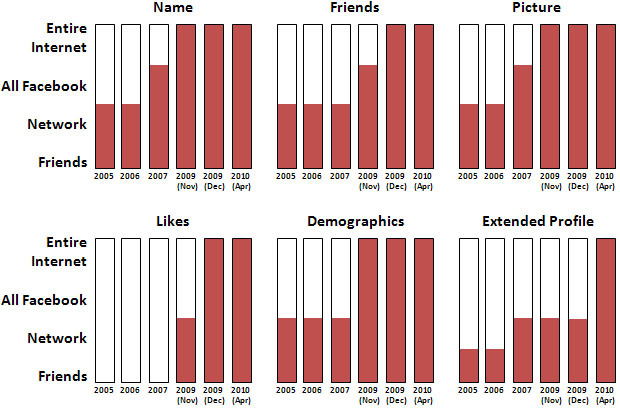 For six different aspects of your Facebook profile, it shows how widely they’re available by default and how those defaults have changed over time. In 2005, for example, your name was available only to your friends and your networks. By 2009 it was available to the entire internet. And by “entire internet,” this often means third party applications who get access to everything you do and everything you like. Some people are fine with that, some people aren’t. But at least you should know.